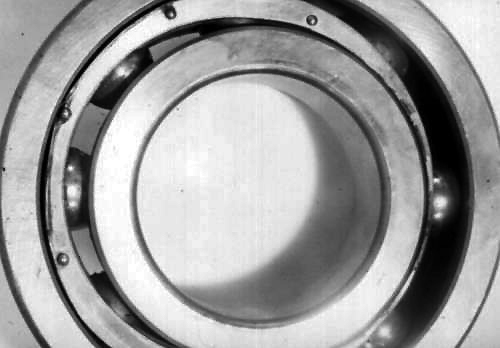 As with plain bearings, analysing and diagnosing rolling bearing failures is all about recognising the visual signs associated with typical failure modes. The first step is therefore to perform a careful inspection of the failed roller bearing race, cage and housing. 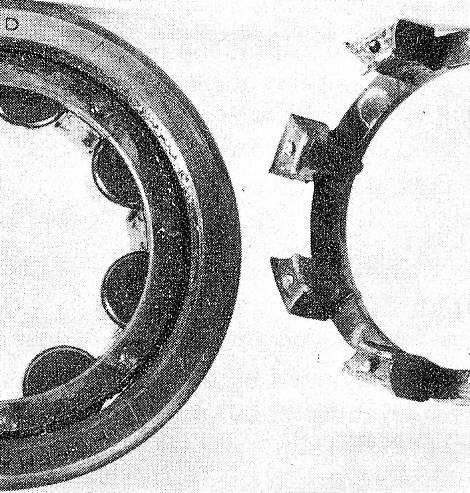 This page lists the typical failure modes for rolling bearings with their associated visual signs and potential causes. Care must be taken, however, to ensure the real root cause is found as more than one failure mechanism can sometimes lead to superficially similar damage. 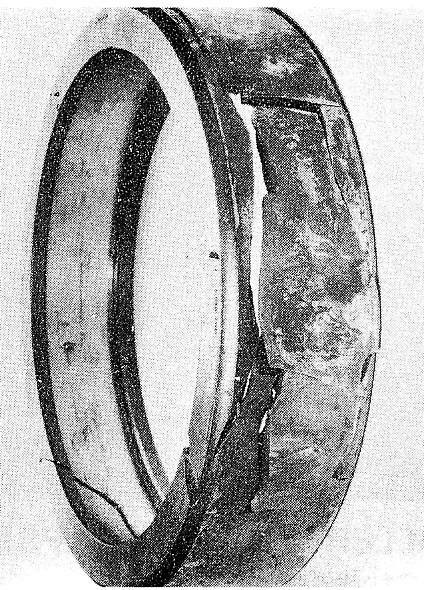 This page lists many typical rolling element bearing failure modes with images showing the associated failure pattern. The information on this page is taken from our Tribology Handbook – a PDF version is available from our site here. 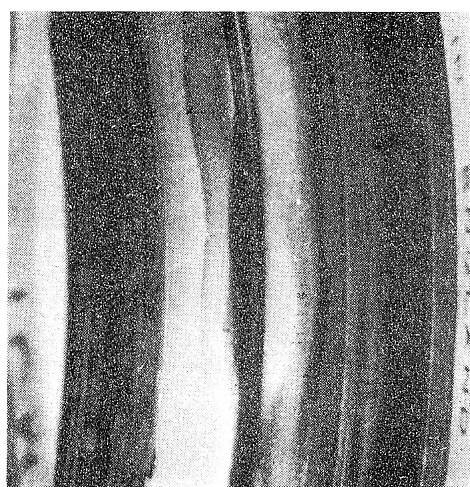 Characteristics: Flaking with conchoidal or ripple pattern extending evenly across the loaded part of the race. Causes: Fatigue due to repeated stressing of the metal. This is not a fault condition but it is the form by which a rolling element bearing should eventually fail. The multitude of small dents is caused by the debris and is a secondary effect. Characteristics: A normal fatigue flake but occurring in a comparatively short time. Appearance as for fatigue flake. Causes: Wide life-expectancy of rolling bearings. The graph shows approximate distribution for all types. Unless repeated, there is no fault. If repeated, load is probably higher than estimated; check thermal expansion and centrifugal loads. Characteristics: Numerous irregular pits, reddish brown to dark brown in colour. Pits have rough irregular bottoms. Causes: Exposure to moist conditions, use of a grease giving inadequate protection against water corrosion. Characteristics: Dark patches on rolling surfaces and end faces of rollers in bearings with yellow metal cages. The patches usually conform in shape to the cage bars. 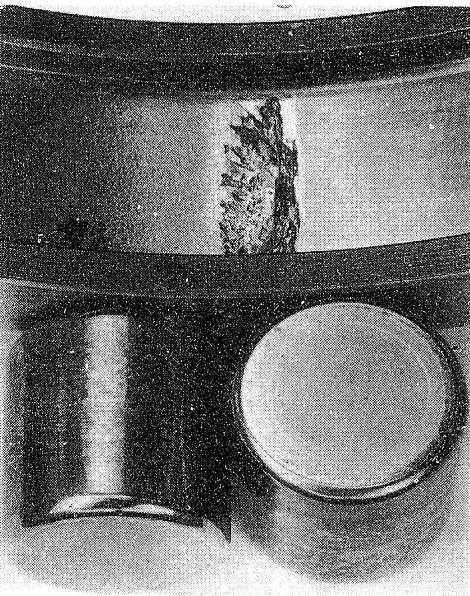 Causes: Bi-metallic corrosion in storage. May be due to poor storage conditions or insufficient cleaning during manufacture. Special packings are available for severe conditions. 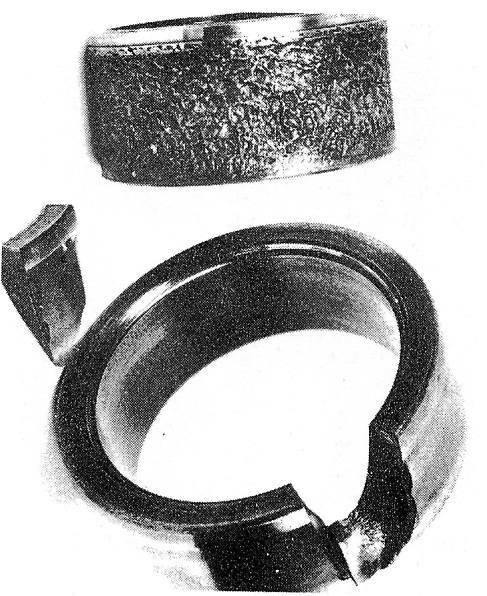 Staining, as shown, can be removed by the manufacturer, to whom the bearing should be returned. 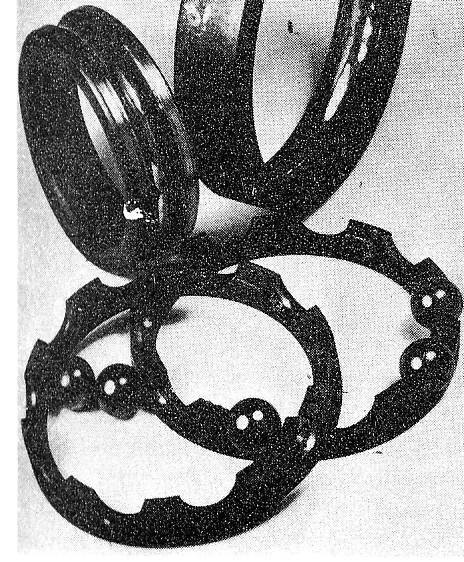 Characteristics: Dents or grooves in the bearing track conforming to the shape of the rolling elements. 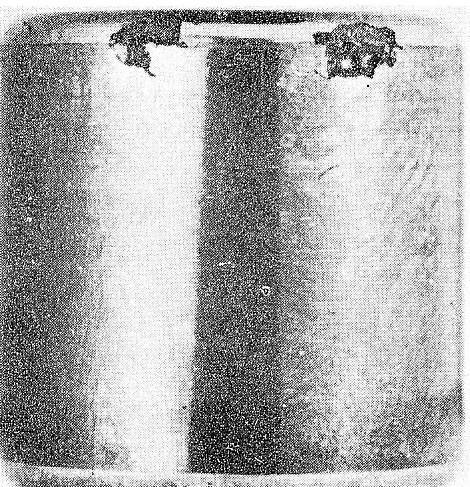 Grinding marks not obliterated and the metal at the edges of the dents has been slightly raised. 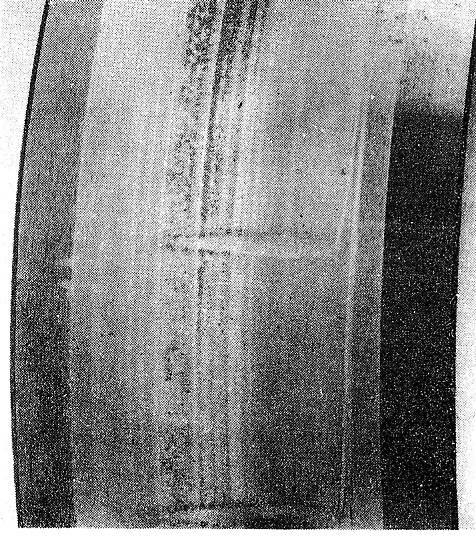 Characteristics: Depressions in the tracks, which may vary from shallow marks to deep cavities. Close inspection reveals that the depressions have a roughened surface texture and that the grinding marks have been removed. There is usually no tendency for the metal at the groove edges to have been displaced. 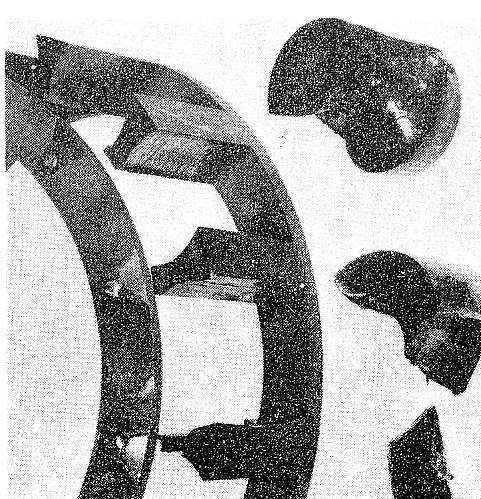 Characteristics: Pieces broken from the inner race guiding flange. General damage to cage and shields. Causes: Bad fitting. 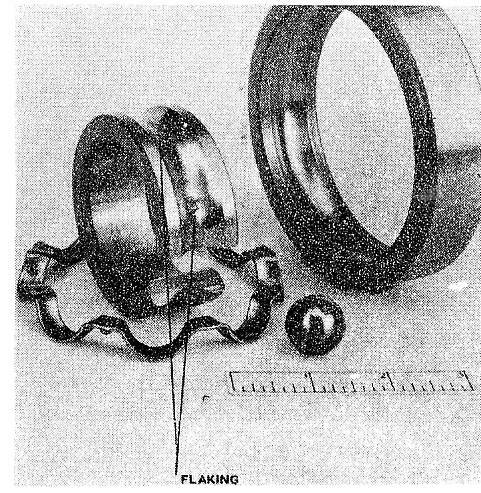 The bearing was pressed into housing by applying load to the inner race causing cracking of the flange. During running the cracks extended and the flange collapsed. 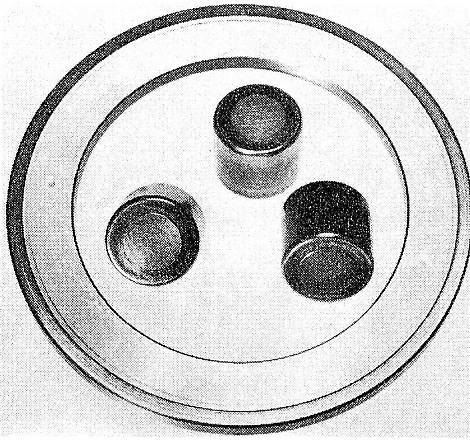 A bearing must never be fitted so that the fitting load is transmitted via the rolling elements. Characteristics: A patchy discoloration of the outer surface and the presence of reddish brown debris (‘cocoa’). The race is not softened but cracks may extend inwards from the fretted zone. Causes: Insufficient interference between race and housing. Particularly noticeable with heavily loaded bearings having thin outer races. Characteristics: Heavy fretting of the shaft often with gross scalloping; presence of brown debris (‘cocoa’). Inner race may show some fretting marks. Causes: Too little interference, often slight clearance, between the inner race and the shaft combined with heavy axial clamping. Axial clamping alone will not prevent a heavily loaded inner race precessing slowly on the shaft. Characteristics: Softening and scoring of the inner race and the shaft, overheating leading to carbonisation of lubricant in severe cases, may lead to complete seizure. Causes: Inner race fitted with too little interference on shaft and with light axial clamping. Characteristics: The running marks on the stationary race are not parallel to the faces of the race. In the figure the outer race is stationary. Causes: Misalignment. The bearing has not failed but may do so if allowed to continue to run out of line. Characteristics: Normal fatigue flaking but much more severe on one side of the running track. Characteristics: The running or wear marks have an uneven width and may have a wavy outline instead of being a uniform dark band. Causes: Ball skidding due to a variable rotating load or local distortion of the races. 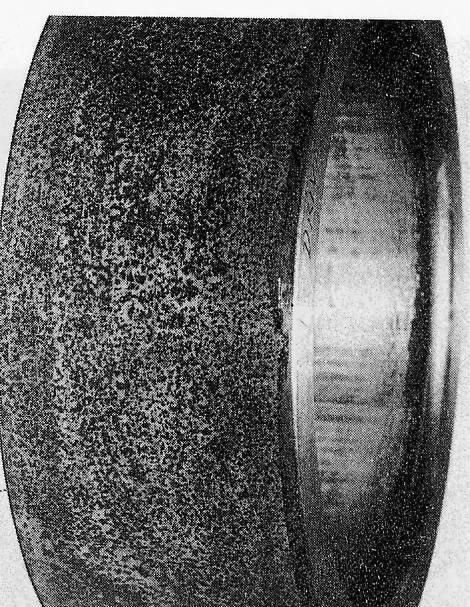 Characteristics: Flaking near the roller-end radius at one end only. Microscopic examination reveals roundish smooth-bottomed pits. Causes: Electrical damage with some misalignment. If the pits are absent then the probable cause is roller end bruising which can usually be detected on the undamaged shoulder. Although misalignment accentuates this type of damage it has rarely been proved to be the sole cause. 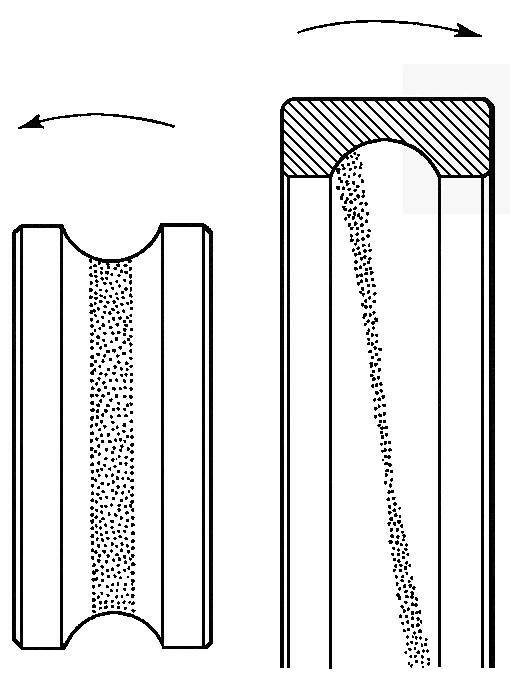 Characteristics: A collapse of the material near the corner radii of the roller. 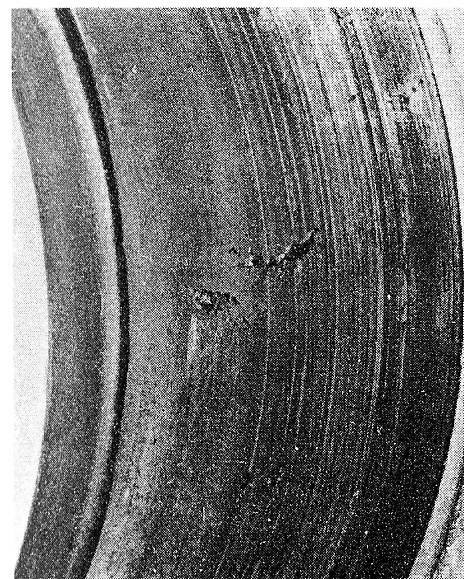 In this instance chipping occurred simultaneously at opposite ends of the roller. 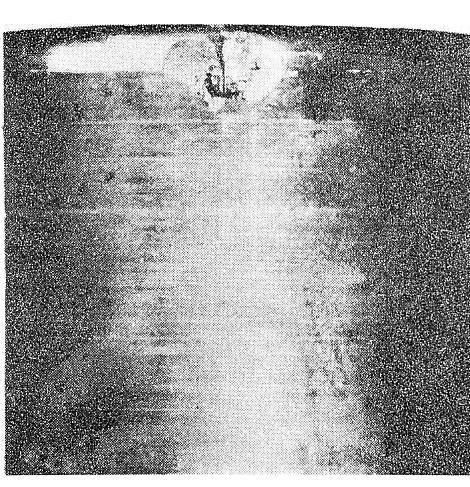 A well-defined sub-surface crack can be seen. 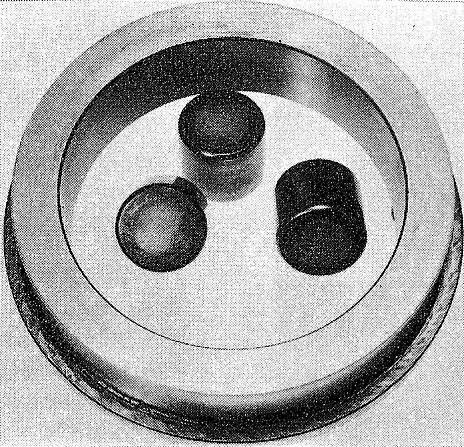 Characteristics: Patches of the surface of the rollers are removed to a depth of about 0.0005 in. Causes: This condition usually follows from an initial mild surface damage such as light electrical pitting; this could be confirmed by microscopic examination. It has also been observed on rollers that were slightly corroded before use. If the cause is removed this damage does not usually develop into total failure. 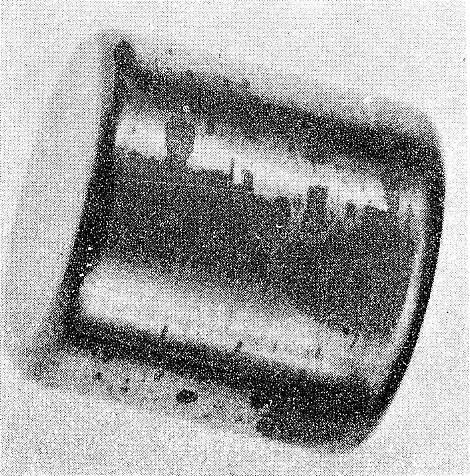 Characteristics: One roller breaks into large fragments , which may hold together. Cage pocket damaged. Causes: Random fatigue. May be due to faults or inclusions in the roller material. 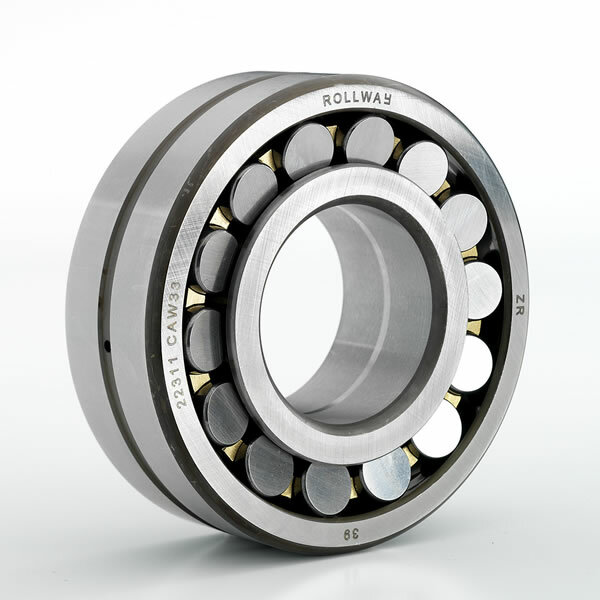 Replacement bearing usually performs satisfactorily. Characteristics: Softening of the rotating track and rolling elements leading to premature fatigue flaking. Causes: Bearing has been rotating in a magnetic field (in this case, 230 kilolines (230 x 10-5 Wb), 300 rev/min, 860 h). Characteristics: A regular pattern of dark and light bands, which may have developed into definite grooves. Microscopic examination shows numerous small, almost round, pits. Characteristics: Cage pockets and rims worn. 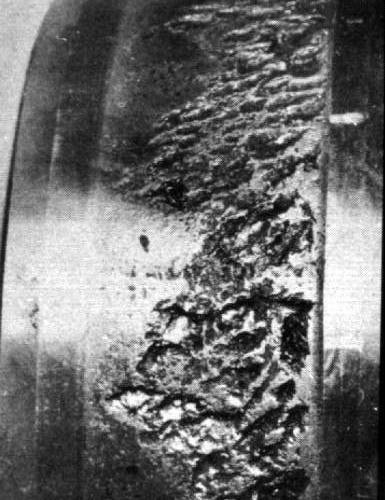 Remaining grease dry and hard; bearing shows signs of overheating. Causes: Use of unsuitable grease. Common type of failure where temperatures are too high for the grease in use. Characteristics: Cage melted down to the rivets, inner race shows temper colours. 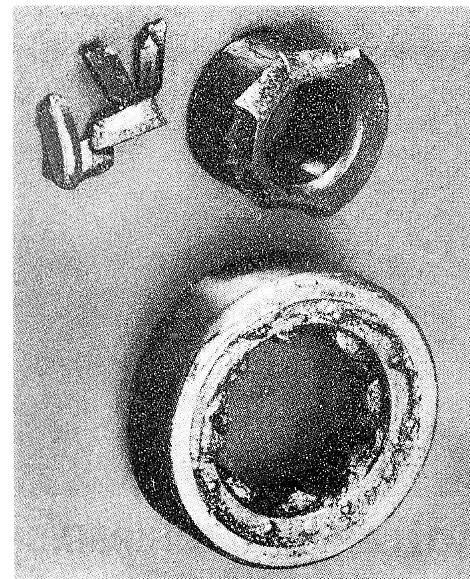 Causes: Lubrication failure on a high-speed bearing. 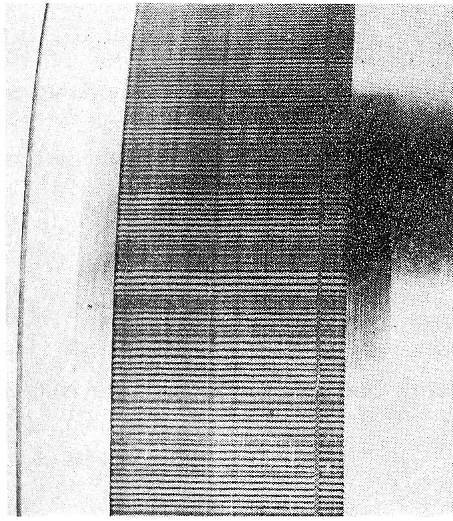 In this case an oil failure at 26 000 rev/min. in a slower bearing the damage would not have been so localised. 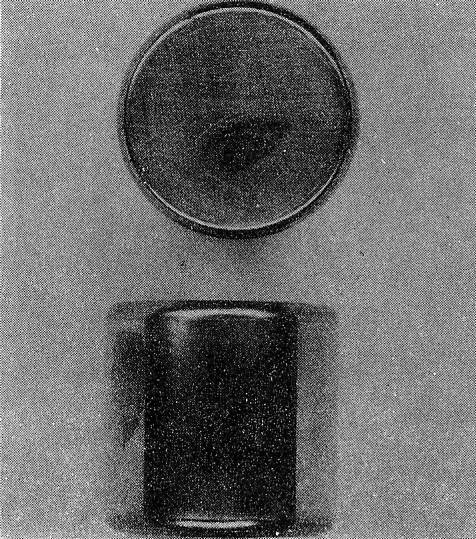 Characteristics: All parts of the bearing are blackened or show temper colours. Lubricant either absent or charred. Loss of hardness on all parts. Causes: Gross overheating. 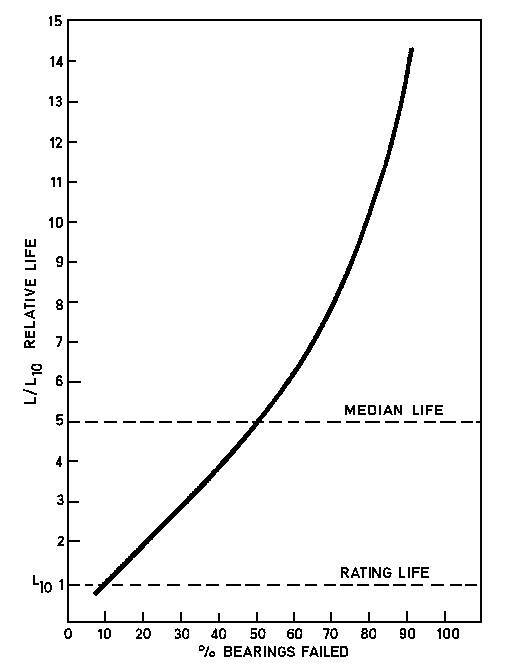 Mild overheating may only show up as a loss of hardness. Characteristics: Scuff marks, discoloration and metal transfer on non-rolling surfaces. Usually some loss of hardness and evidence of deterioration of lubricant. 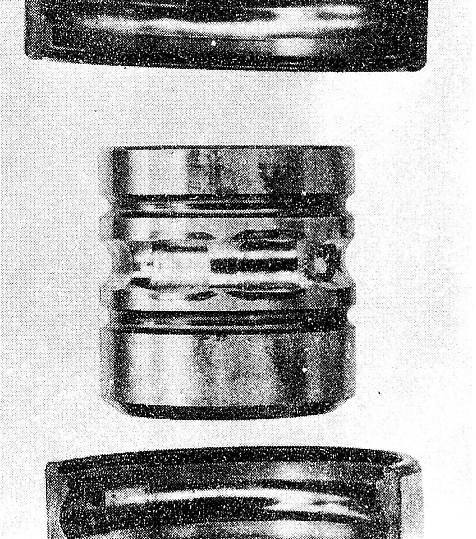 Often found on the ends of rollers and the corresponding guide face on the flanges. Causes: Heavy loads and/or poor lubrication. Characteristics: Dulling of the working surfaces and the removal of metal without loss of hardness. Causes: Abrasive particles in the lubricant, usually non-metallic.